‘HAVING A LOVELY TIME’. With an Instagram bio that cheery, I’m not surprised at the bubbling life force that comes through the phone when I get hold of Maya Jama. Our interview comes in the week following Jama’s photo shoot at the PHOENIX studio, where the Bristol-born TV and radio presenter lit up a wintry Thursday afternoon with her trademark exuberance, rocking bold red and pink looks with a confidence that belies her 23 years. “I like to stand out,” she says. “I think just be the bright little bubble in the room whenever you can”. It’s a mantra that seems to be working out very well for her so far. When we speak, I’ve caught her on yet another shoot, somewhere between hair and going on camera. Given what a success story 2017 was for Jama – primetime presenting gigs on ITV1’s Cannonball and Channel 5’s MOBOs took her exposure to the next level – it’s no shock to find that she’s such hot media property (and those almost-too-good-to-be-true looks can’t hurt). I think just be the bright little bubble in the room whenever you can. A quick peek at Jama’s YouTube channel – which she set up in the early days when she was trying to break into presenting – reveals such video gems such as ‘Relationship advice: when is it ok for girls to fart or burp?’ When I ask about career highlights so far, she remembers “an insane back-to-back freestyle garage MCing” session with Alesha Dixon for Rinse FM. The picture that emerges – of an uncontrived, even goofy enthusiast – makes a refreshing change in an industry full of earnest staged selfies and sponsored posts. I could see what my dad was doing and what my stepdad was doing and I could clearly differentiate between the two – like this is good, this is bad. But for all her light-hearted sparkle today, Jama has not had an easy ride. Born in 1994 in a predominantly white inner-city Bristol to mixed-race parents – her mum is Swedish and her dad of Somali descent – Jama watched her dad be whisked away by police when she was just three years old. His first stint in prison in 1997 was followed by a string of sentences throughout her childhood, and their relationship was reduced to weekend visits. Before she even hit puberty, Jama made the difficult decision to cut her dad out of her life completely. Community is clearly important. A born and bred Bristolian, Jama is of the Skins generation so, for her, the concept extends far beyond the traditional family structure: she describes her home city as “one big cool little community where everybody was friends”. Jama is full of respect for her “super super amazing” support system – her mum, school friends, her manager and her London ‘family’ – who help her stay grounded. “Whenever I’ve felt like I’m drifting from my own self, I’ll just go back to the people that have always been there and get them to send me back down to Earth,” she laughs. But Jama is keen to debunk any aura of effortlessness, particularly when it comes to her career. She’s upfront about the hard work she’s put in to become so successful at such a young age. 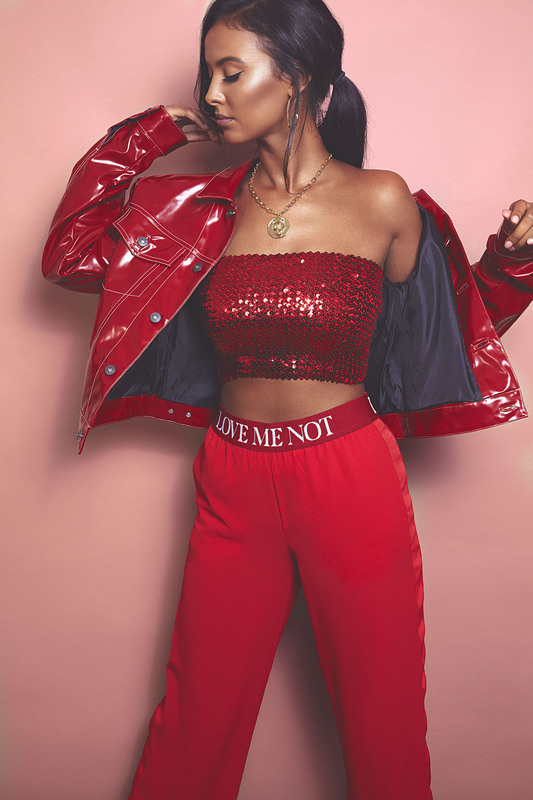 After moving to London solo at sixteen, she paid her own way by holding down a job at Urban Outfitters on top of doing a lot of free work presenting for JumpOff TV, all while still studying at college. Whenever I’ve felt like I’m drifting from my own self, I’ll just go back to the people that have always been there and get them to send me back down to Earth. Jama’s commitment to transparency extends to social media . With a huge Instagram following of 436K, she is an appropriate ambassador for shaking up the damaging highlights-reel the platform has become. Yes, she still posts achingly gorgeous selfies – but with captions like ‘feeling like a gross curled up prawn right now’ and ‘lol the air hostess caught me posing’ she at least hints at the less-than-perfect reality behind the images. Jama advocates for being in control of what you consume, and a mindful wariness of how poisonous comparison can be. “Instagram should be there to inspire you and motivate you, so if you’re scrolling through someone’s page wishing you were like them, then you should unfollow the account,” she says. Like her boyfriend Stormzy, the chart-topping grime artist, Jama’s uncensored candour is where her appeal lies. Together, the couple are fronting a new wave of young British cultural icons, both using their status to talk openly about their vulnerability, and issues that are relatable to fans. While Stormzy has rapped about suffering with depression, Jama has made a deeply personal journey public with her Channel Five documentary When Dad Kills: Murderer in the Family – a programme exploring what it’s like to live with a parent behind bars. Just keep reminding yourself why you started – and always pay attention to any little things that pay off. With the 2018 she has lined up, I don’t think there’s any need to worry about that.